Well, by now you know that we are all about the seasons around here. But sometimes it’s nice to see an expression of seasons in a way that isn’t so typical. Take autumn, for instance. You think autumn wedding cake, your mind automatically goes to colored leaves. But here’s another take on the colors of fall: rich red roses. It was love at first sight when I saw this cake. 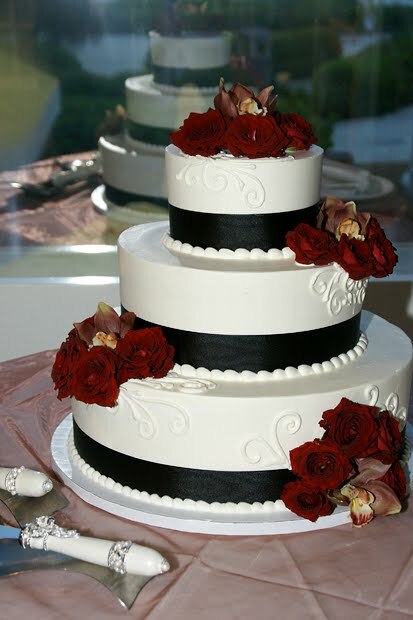 The simple buttercream finish is trimmed with a wide, black ribbon, elegant scrollwork, and the most beautiful deep red roses. For an interesting contrast, the roses are paired with orchids. You would never think, “I know, I’ll put orchids and roses together. And, make that red roses and purple orchids.” Usually, these flowers like to be the stars of the show. But, it just…works. But ya know what? This cake would also be breathtaking for a Christmas-themed wedding, I’m thinking. Mason’s Bakery has been making breathtaking cakes for the good people of Ft. Myers, Florida, for more than half a century! And with a focus on the customer, delicious cakes, and attention to detail, we think that business will continue to boom.